It’s that time of year again! The air is getting crisp, the lights are going up, and holiday cheer can be heard from all around. Some may say it’s the most magical time of year in the city, and we can’t help but feel the same way. The bay area is bustling and full of activities with everything ranging from a boat parade to a Santa-themed pub crawl—needless to say, the options are endless! We’ve narrowed down our favorite events of the season for you to enjoy as you prepare for your second winter at ONE Mission Bay. 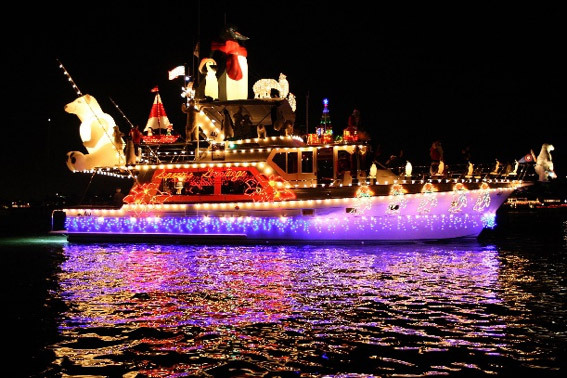 Lighted Boat Parade – Bundle up, because the largest boat parade on the San Francisco Bay is back once again! A highly anticipated holiday tradition since 1994, this event boasts a mesmerizing display of lights as a fleet of more than 60 illuminated boats parade down the waterfront after sunset. The boats will set sail on Friday, December 14th off of Pier 39 and head west past Fisherman’s Wharf and Fort Mason before turning around at Crissy Field. Spectators can gather along the waterfront for free to watch this holiday magic unfold. The parade begins promptly at 6pm and lasts until 8pm, so have some hot chocolate in hand to sip on as you enjoy the view. If you prefer to be somewhere warmer, you can also observe from one of the many restaurants along Fisherman’s Wharf that will be featuring traditional holiday menus. In case you are unable to attend that evening, there’s no need to worry! The Fisherman’s Wharf Fishing Fleet boats will remain lit for the remainder of the holiday season. 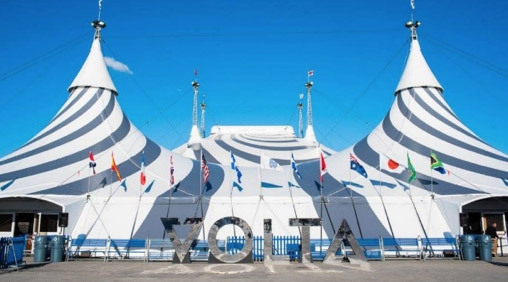 VOLTA – Cirque du Soleil is in town, and it just so happens to be a mere 5-minute walk from ONE Mission Bay! VOLTA is an engaging, urban, and lively story of transformation and discovering one’s true potential. Showcased under the Big Top at AT&T Park, this production features aerial performances, ballet, rope skipping and never-before-seen acrobatics that is sure to leave you feeling inspired. VOLTA will be the talk of the city starting November 15th through February 3rd, allowing for many opportunities to catch the show. General Admission starts at $54, or choose the Hennessy Black VIP package with open bar and hors d’oeuvres if you desire the ultimate experience! Click here to get your tickets! SantaCon – If you are in search of a more adult-friendly activity, SantaCon is the place for you! This Santa-themed pub crawl is featured in cities around the world—call us biased, but we just so happen to think that San Francisco is renowned as the greatest of all SantaCons. Taking place on Saturday, December 8th, this extravaganza will descend upon Union Square beginning at noon. Thousands of Santas, Elves, Reindeers, and holiday characters alike, will come together for a full day of bar hopping at participating pubs. This event helps raise money for local charities, so don’t forget to bring a donation of a new and unwrapped toy for a child in need. Get your costumes ready and start rehearsing your holiday carols because there will be singing, and a whole lot of it!